Preheat oven to 180°C. Line a large baking sheet with baking paper and set aside. Combine the sugar and butter in a bowl, beating with an electric beater for 3 minutes until light and fluffy. Add egg whites, vanilla and orange zest. Combine in a separate bowl the flour, oats, cinnamon, salt and baking powder. Combine the two separate bowls to make one mix. Form the dough into small balls on the baking sheet and bake in the oven for 10 minutes. Transfer from the tray once out of the oven onto a rack to cool completely. Mix yoghurt, Baking Blend. Beat in the egg. Combine flour, baking powder, vanilla essence and cranberries and then add to the yoghurt, beaten egg and Baking Blend mix. 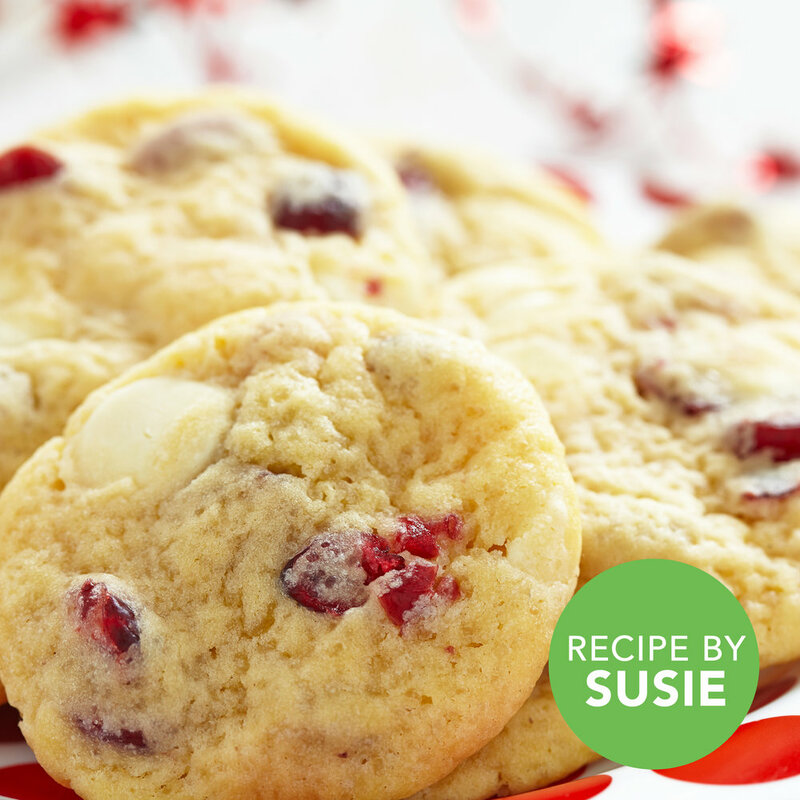 Drop spoonfuls of batter onto baking tray and cook for 8-10 minutes until cookies are lightly browned. NB: The texture of your biscuits will be quite light and fluffy. Preheat oven to 180°. Grease muffin tin and set aside. Combine vanilla essence, butter and banana in a bowl. Combine flour and baking blend in another bowl. Fold the wet ingredients into the dry mixture and combine. Pour into muffin tin and bake for 20-25mins. 1. Mix egg, banana and melted butter. Add in peanut butter. 2. Combine with flour, baking mix and cereal. 3. Mould into balls and bake at 160° for 10-12 minutes until cooked through. Combine mixed cereal, baking blend, baking powder and flour. Mix with milk, eggs and vanilla essence. Heat pan to medium and spread with olive oil. Spoon 2-3 tbsp. mixture and cook each side for 2-3 minutes then flip. Serve with ricotta or Greek yogurt and a little syrup. Mix flour, bicarb, baking blend with mashed banana, vanilla, eggs, milk and butter. Spoon into loaf tin and bake at 180° for 45-55min until cooked through. Put coffee, Whole Earth Raw Cane 50 and cocoa powder in a medium jug and whisk until combined and Raw Cane 50 has dissolved. Refrigerate for 30 minutes or until chilled. Drizzle the inside of two tall glasses with a little chocolate topping. Fill glasses with crushed ice. Pour in milk, top with ice-cream and then pour over cooled coffee mixture. Serve immediately. Preheat oven to 180C fan-forced. Grease a ceramic fluted quiche dish (base measures 25cm) with a little melted butter. Line the base with baking paper. Put butter, Sweet Granules and vanilla into a large bowl and beat with electric hand beaters for 2 minutes or until combined and slightly paler in colour. Add egg and beat again until combined. If mixture splits a little that's okay. Add sour cream and beat again until combined. Sift in flour and bicarbonate of soda, and gently fold until combined. Pour in milk and stir thoroughly. Spoon batter into dish and smooth surface. Bake for 20-25 minutes or until golden brown. Set aside in dish for 15 minutes before turning out, upside down onto a wire rack to cool completely. Meanwhile, put 8 of the blueberries into a small saucepan and squash each with the back of a teaspoon. Add 4 wedges of the peaches and sweet granules then pour over 1/2 cup water. Set over medium heat and bring to the boil. Simmer for about 3 minutes, stirring until a purple liquid forms. Transfer to a large bowl, and set aside in the fridge for 30 minutes or until cold. Strain through a fine sieve discarding fruit if desired or reserving it for serving. Just before serving, add mango and the remaining blueberries and peach slices to the cooled syrup and toss to coat. Transfer tart base to a serving plate, spoon whipped cream on top, then spoon over the mango, peaches and blueberries including the syrup at the bottom of the bowl. Scatter the edge of the tart with almonds. Garnish with mint leaves and serve immediately. Preheat oven to 180ºC fan-forced. Line 3 oven trays with baking paper. Put butter and Whole Earth Baking Blend into a large bowl; mix with a hand whisk until combined. Add egg, vanilla and cocoa and mix with hand whisk until combined. Add flour and stir with wooden spoon until combined, and a very soft dough forms. Chill for 10 minutes to firm up slightly. Put chocolate chips and almonds on a dinner plate and mix to combine. Roll tablespoons of dough into balls, press down slightly to flatten into thick discs. Push one side of each dish into chocolate chips and almonds then arrange chocolate and almond side up, 5cm apart on prepared trays. Bake for 15 minutes, swapping tray positions half way through cooking or until lightly browned on the edges and just firm to touch. Set aside on trays to cool completely. Then serve. Put watermelon, frozen raspberries, coconut water and Nature Sweet into a blender and process until smooth. Pour mixture into a large zip-lock bag and seal, expelling air. Put bag onto a freezer safe tray and freeze for 6 hours or overnight until mixture is solid. Remove from freezer, and set aside for 5 minutes at room temperature. Open bag and use a fork to scrape frozen mixture into granita flakes. Spoon the granita mixture into 6 chilled stemless wine glasses. Garnish with lime rounds and fresh raspberries. Serve immediately topped with wine, as desired. Preheat oven to 180ºC fan-forced. Grease a 22cm round cake tin and line base and sides with baking paper. Put butter and chocolate into a large microwave safe bowl. Microwave on high 100% for 30 second intervals, stirring, until melted and smooth. Add Whole Earth Baking Blend, eggs, milk and vanilla, then beat with a whisk until combined. Sift in flour and cocoa and stir with whisk until a smooth batter forms. Pour into prepared tin. Smooth surface and bake for 30-35 minutes or until cooked when tested with a skewer. Set aside for 15 minutes to cool slightly, then remove from tin and transfer to a wire rack to cool completely. To make chocolate icing, put Whole Earth Baking Blend and boiling water into a small bowl and stir. Then set aside for 5 minutes until most of the Baking Blend has dissolved. Put butter into a large bowl and beat with electric hand beaters for 1 minute or until light and creamy. Add the Baking Blend mixture and cocoa and beat again on low speed until mixed. Then beat on high for 1 minute until smooth. Spread icing over the top of the cake. Decorate with chocolate curls. Put lime, mint and Whole Earth Raw Cane 50 into a large jug and muddle with the end of a rolling pin to squash the limes, infuse mint flavour and help dissolve the sweetener. Divide mixture between four tall glasses, top with rum, crushed ice, passionfruit pulp and soda water to fill glasses. Garnish with passionfruit quarters and extra mint. Preheat oven to 180°C. Shift dry ingredients together; set aside. Beat butter and Whole Earth Sweetener Baking Blend until well blended. Mix in honey, eggs and vanilla. Gradually blend in flour mixture. Stir in oats and chocolate chips. Portion dough by tablespoon onto ungreased baking sheets. Bake 13 to 16 minutes or until lightly browned at edges and centre is warm to touch. Remove from oven and cool for 5 minutes’. Remove cookies from baking sheet onto wire rack and cool completely. Buddy Valastro is a paid endorser of Whole Earth Sweetener Co. Combine all ingredients in blender or food processor. Puree until smooth. Divide mixture evenly between 6 glasses to serve. Preheat oven to 180°C. Spray 20cm x 10cm loaf pan with cooking spray; set aside. Beat butter, Whole Earth Sweetener Baking Blend, and Nature Sweet packets until combined. Beat in bananas, buttermilk, egg and extracts until blended. Stir in dry ingredients, 2 tablespoons of the pecans and the walnuts. Spoon batter into prepared pan. Sprinkle remaining 1 tablespoon pecans over the top. Bake 50 to 60 minutes or until wooden pick inserted near center comes out clean. Let bread cool in pan 10 minutes. Carefully remove bread and cool completely on wire rack. Preheat oven to 190°C. Line a 33cm x 22cm baking pan with aluminum foil. Spray bottom with cooking spray; set aside. Whisk yogurt, egg whites, Baking Blend, Nature Sweet, applesauce, melted butter, cinnamon and vanilla in mixing bowl until combined. Mix in flour and baking soda until blended. 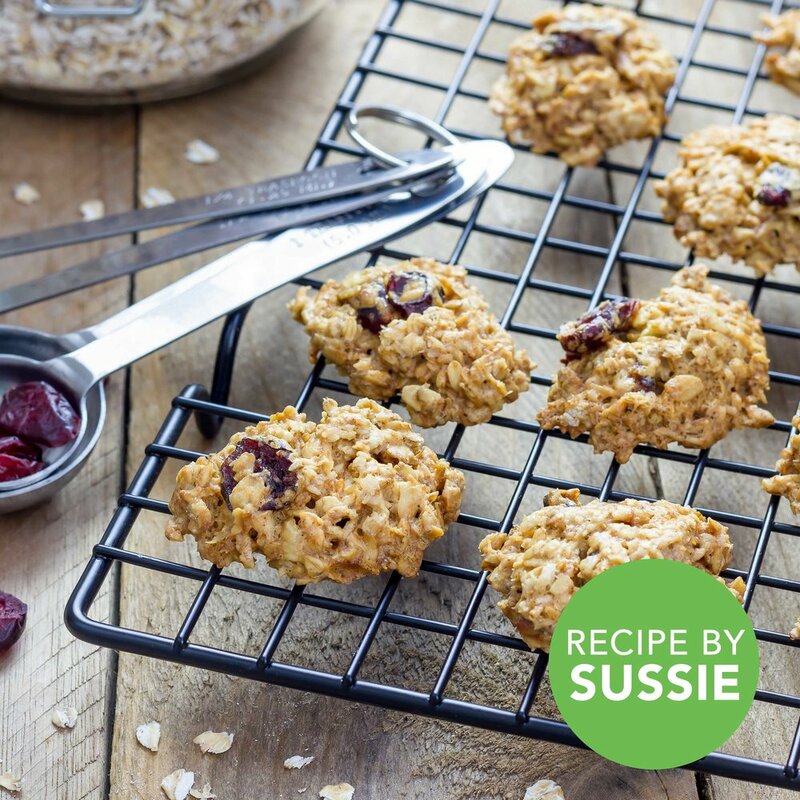 Stir in oats, cherries and sunflower seeds until a thick batter is formed. Spread mixture evenly in prepared pan. Bake 19 to 21 minutes or until top is golden and wooden pick inserted in center comes out clean. Remove from oven and cool completely on wire rack. Grasp ends of foil and remove from pan. Cut into bars. Store in tightly covered container at room temperature.